With the birth of a new year comes a myriad of opportunities to improve yourself on the inside and the outside. Here are some ways to take control of your health in 2019. See your doctor or primary care provider for a check-up, vaccination or screening. Regular care can help detect potential health problems before they start or can find problems early, giving you improved chances for treatment and cure. Make an annual wellness check-up a priority. Remember to wash your hands. Germs spread easily from dirty hands, even when hands aren’t visibly dirty. Wash your hands thoroughly with soap and warm water, or if soap and warm water aren’t available, use an alcohol-based hand cleaner. Give up tobacco and vaping. Science has thoroughly proven the dangers of using tobacco products and continues to find dangers in vaping. Kick the habit and save yourself the money, health problems and unappealing smell, as well as minding the health of those around you who may be exposed to secondhand smoke. Louisiana residents can find help quitting tobacco by calling 1-800-QUIT-NOW or visiting quitwithusla.org or wellaheadla.com. Choose a healthier diet. Instead of focusing on losing weight, a more realistic goal is to put more of a priority on fresh fruits and vegetables, whole grains, beans, eggs, nuts, poultry, fish and lean meats. Opt for foods low in saturated fats, trans fats, cholesterol, salt and added sugars. Consider preparing meals in advance on Sundays so that you’re less likely to pick up a burger and fries from the nearest drive-thru on your way home. You may just find that adopting healthier eating habits will move you toward a more healthy weight. Find out more at wellaheadla.com. Get moving. The federal government recently updated its recommendations for physical activity and came up with a clear conclusion: Americans are not getting enough. The new guidelines recommend a minimum of 150 minutes a week of moderate-intensity physical activity for adults, 60 minutes or more for children ages 6 to 17, and physical activity throughout the day for children ages 3 to 5, noting that activity throughout the day enhances young children’s growth and development. Walking, taking the stairs instead of the elevator, whatever it is, just move. Everything helps. Aim for a good night’s sleep. Type 2 diabetes, cardiovascular disease, obesity and depression are among the conditions tied to insufficient sleep, not to mention the number of accidents on the road that occur because drivers are too tired to be behind the wheel. Visit the National Sleep Foundation for guidelines on sleep duration for all ages. Wear your sunscreen when you’re spending time outdoors. Yes, that includes wintertime. Exposure to the sun provides a much-needed boost to vitamin D in the winter, but you still want to protect yourself from skin cancer, the most common type of cancer. Don’t forget to protect your eyes as well: wear quality sunglasses even if it’s cloudy. Drink enough water. You don’t necessarily have to aim for eight cups a day, but lots of water is essential for good health. The National Institute of Medicine recommends 91 ounces a day for women and 125 ounces for men. That includes water that comes from all beverages and foods. Monitor your mental health. Whether it’s anxiety, depression, hormonal fluctuations, stress or anything else, take your mental health seriously. Don’t be afraid to seek help. If you’re struggling, make it a priority to get help. Don’t suffer in silence. Find what works for you, be it counseling, yoga, medication or something else. 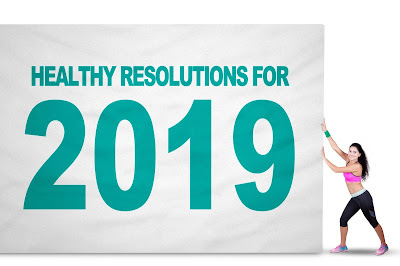 Have a happy and healthy 2019!